Millions of pounds are spent every year on anti-ageing creams of every type, colour and description. In fact, according to one survey, over 30% of women over the age of 30 in the UK uses an “anti-ageing” skin product. But just how effective are these anti-ageing creams? Are they worth the money we are paying for them? It’s not surprising that we are spending so much of our hard-earned cash on anti-ageing products. Everywhere we look, we are bombarded with airbrushed images of models and celebrities, looking impossibly youthful for their age, and suggesting that we should be too, if we are not to be judged and laughed at. While in the past, having a wrinkle or two was believed to “add character” to a face, nowadays, it is seen as the ultimate image faux pas. So what’s the magical ingredient in anti-ageing creams? Anti-ageing creams nowadays are pretty ‘high tech’ and do contain ingredients which have proven effects on the skin. These include things like vitamin A which has a light inflammatory action that 'puffs up' the skin, thus making wrinkles look less deep – so giving the overall appearance of reduced wrinkles. A similar ingredient is retinoids which induces skin to produce new cells more quickly, leading to the skin looking smoother after a few months of use and fine lines will be less noticeable. Another powerful anti-ageing ingredient is vitamin C which can boost collagen production and circulation, leading to a brightening effect on the face. Finally, alpha-hydroxy acids (AHAs) are another substance often included in anti-ageing cream formulations as they speed up the shedding of old, dead cells, this removing the “dullness” and improving the skin’s appearance. These are probably the most popular. They usually contain retinoic acid, which is a derivative of vitamin A, and which has been proven by research to reduce the appearance of wrinkles. It does this by speeding up the turnover rate of skin cells, so that old, dead cells can be shed and new ones grow to replace them faster. This leads to the overall appearance of smoother skin. Other ingredients included in anti-wrinkle creams are natural extracts (eg. from fruits or milk) which contain mild, lactic, glycolic acids that have a peeling action on the outer layers of the skin – again helping to reveal the fresher, smoother complexion beneath. All of these, however, only work on fine wrinkles and will have no effect on deeper ones. Serums contain many of the same ingredients found in anti-wrinkle creams, such as retinoids and glycolic acid and antioxidant vitamins. The only difference is that the active chemicals are found in very concentrated forms. This means that they really need to be used very sparingly. Just four to five drops should suffice to cover the entire face. Serums also need to be applied at night for them to work best. Because of their higher levels of active ingredients, serums do seem to be more effective than anti-wrinkle creams in producing an improvement in skin appearance – for example, a 25% vitamin C serum has been shown to produce visible skin tightening effects after a period of extended use. Usually, anti-ageing effects will only be visible after at least 4 to 6 weeks of regular use. These products contain a range of ingredients to work on the skin during the night. The most common is alpha-hydroxy acids, sometimes also known as glycolic acid, which has an exfoliating action, peeling the top layer of skin to remove the dull, old cells and revealing the fresh layer beneath. It also boosts collagen production when it is used for a prolonged period. Collagen is an important protein in the anti-ageing battle because it helps to maintain skin elasticity and prevent wrinkles. 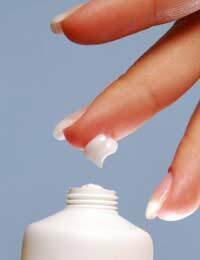 Another common ingredient in night creams is an intensive moisturiser – such as isopropyl alcohol or stearyl alcohol. Finally, some night creams also contain whitening agents to help reduce the appearance of blemishes. Nothing is as ageing as heavy bags or wrinkles around the eyes therefore it’s no small wonder that women spend so much time, effort and money on protecting and nourishing the eye area. Because the skin around the eye is so much thinner, it can easily become dehydrated which leads to wrinkles. Thus, most eye creams and gels focus on hydration and moisturisation and include ingredients like vitamin C and E, as well as collagen sometimes. Some eye gels also contain vitamin A in the form of retinoic acid – however, be careful with higher concentrations as this can irritate the already sensitive eye area. Collagen creams are controversial. They are supposed to increase the amount of collagen which is a vital protein for maintaining skin elasticity and tautness. However, while many women who use it swear by its skin-tightening abilities, there is as yet no scientific evidence to conclusively prove that collagen can be effectively absorbed by applying it in cream form on the skin. Are anti-ageing creams the answer? While many of the ingredients used in anti-ageing creams do have proven effects on improving skin appearance, there is still a lot of doubt and criticism about the effectiveness of anti-ageing creams. For example, a trial conducted by Which? Magazine tested 12 ordinary moisturisers against 12 “anti-ageing” creams on a group of nearly 100 women for 4 weeks. At the end of the trial, most women could not notice any difference in the look or feel of their skin from anti-ageing creams compared to simple moisturiser. Many scientists believe that the active ingredients used in anti-ageing creams are only present in such low concentrations that they cannot produce much result and any real benefit simply comes from the moisturiser in hydrating your skin. In addition, some of these ingredients, such as retinoids, can actually irritate your skin and make you more sensitive to UV exposure – which actually contributes to ageing. Even if there is any noticeable change, it is only during prolonged use of the cream. The minute you discontinue use, your skin reverts to its original condition. Most of all, all anti-ageing creams only work on fine lines and superficial appearances – they have no effect on deep wrinkles or other deeper blemishes. At the end of the day, there is no miracle cream that will just erase all signs of ageing through a few applications. The best things you can do to slow the ageing process is to eat a healthy, balanced diet, stay out of the sun and/or apply sunscreen and avoid environments with smoke pollution.